Each bookcase needs 3 metres of books that cover all ages from 0-16 years of age. The photo on the right is of our first Asda collection. We spent one Saturday afternoon handing out A6 flyers and following Saturday afternoon collecting. We ended up with just over 7 metres of useable books and took 10 bags of books to our local charity shop. That was 2 refuges sorted in just one collection! We have also just received 21 bags of books in lovely condition from a volunteer who organised a collection in her grandson’s primary school. The local charity shop gained 8 bags of books. 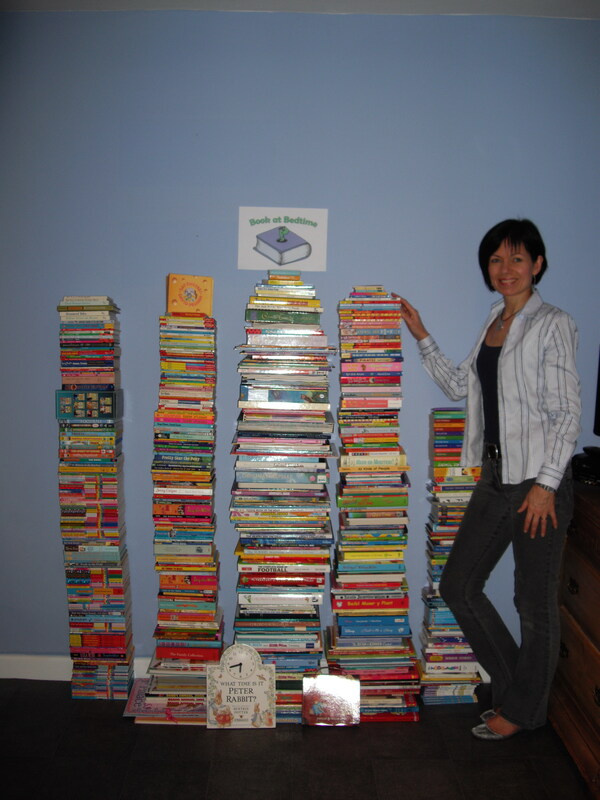 And another collection at a volunteer’s place of work that gave us a perfect 3 metres of books to fill a bookcase. Their bookcase was delivered at Easter time and strangely enough there were some extras delivered that looked more egg shaped than book shaped. The children in the refuge loved that delivery! So what type of books are we looking for? The books need to be in very good condition (almost as new) with no markings, writing or missing parts (stickers. charms, CDs, etc). Because of this we do not accept donations from libraries because they will have the library markings on them. We also do not accept annuals because they date so quickly or books that are specifically related to one religion. Books that cover all religions in an inclusive way are fine. However, when you are holding your collection please accept all donations gratefully (except directly from a libary) and then privately sort out the ones that fit our criteria. The rest please donate to your local charity shop. Even defaced books have a value to them as they get money for the recycle weight. You can also volunteer to become a Book at Bedtime Friend of your local Women’s refuge to provide an annual top-up of books so that as the children take their favourite books away with them the refuge is not left with too much space in their bookcase. Let us know you want to volunteer and we will contact your nearest refuge to start the ball rolling. We are always here for help and advice along the way. Please help us fill more bookcases and enable a child to disappear inside the wonderful world of a book – even if only for a little while. Thank you.